Our "liberum arbitrium" was the renovation of Talež, a deserted small hamlet in the inland of Vis. It was founded by the Borčić family (the Kosans) at the end of 18th and the beginning of 19th century. 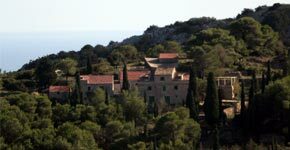 The hamlet is situated at 220 metres above the sea level, and is surrounded by cypresses and pine trees. It lies 5o metres below the top of a high ground which offers a wonderful view over the south Adriatic islands Sušac, Lastovo, Korčula and Hvar. Moreover, on a bright sunny day you can even see the island of Palagruža, as well as the Italian mainland. On the other side, the hamlet has a view of a valley with vineyards, as well as the surrounding villages: Podšpilje, Žena glava, Duboka and Borovik. Nearby, only several hundred metres to the south-west is one of the oldest archaeological sites Glavica, also known as the "Teuta's lighthouse", situated at 245 metres above sea level. Presumably, it dates from the 4th century B.C., and was the largest lighthouse in this part of the Adriaric. The renovation of the hamlet began in 2000., with the aim of restoring its original appearance. "The peaceful atmosphere of Talež, the smell of imortelle, rosemary, sage and heather, the warmth of a baker's oven, crickets, the wind blowing through pines at midday, the voices of field laborers in the valley, all of this is indelibly etched on my childhood mamory, when, as a little girl, I used to spend much of my summer breaks at my grangrandmother Franina's".